When we were planning our trip to France, there was no doubt we wanted to splurge and cross a wine destination off of our bucket lists, but with so many remarkable options, it wasn't easy to pick! After some debate, my travel buddy/BFF/fellow wine lover Trish and I set our sights on the cellars of Reims thanks to its proximity to Paris and its Champagne. We quickly learned that it also had history, architecture, and culture to discover. 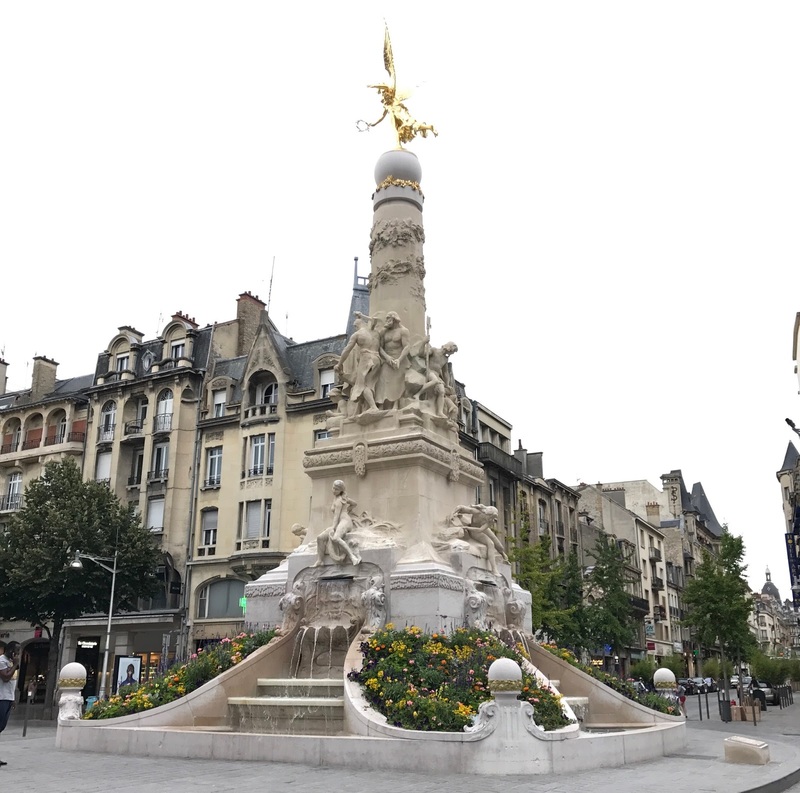 Fountain in the center of Reims. After a train ride across northern France from Bayeux to Reims, our first destination was Maison Mumm. Located in the heart of Reims, Mumm has been making its famous Champagne since 1827. Our tour started with a introductory video, followed by a walk through their caves, and ended with a tasting of their extraordinary bubbly. The tour guide focused heavily on the art of making Champagne, detailing every aspect of the process. I highly recommend the Mumm tour if you'd like to learn the production basics, as well as taste a variety of their cuvées. Cuvée (n.): In Champagne, the first press of the finest grapes. In other regions, a cuvée is a blend of wines. Miles and miles of tunnels full of Mumm Champagne. A glass of Mumm with their signature red ribbon. Outdoor tasting area at Maison Mumm. 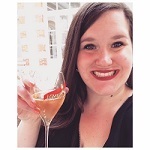 I may or may not have cried happy tears when we stepped into Veuve Clicquot's Champagne house. Either because we were running late and just made our tour, or because I have long admired the Widow Clicquot and her legacy. Probably both. As a marketing professional by day, I revere Veuve's luxury marketing and branding strategy. With its yellow labels and polished images, this brand is nothing short of iconic. Our Veuve tour guide spent sufficient time on the wine making process, but she focused on the history of the Champagne house and the life of Le Grand Dame Barbe-Nicole Clicquot (née Ponsardin). She also touched on details like their famous anchor symbol, which was chosen in 1798 by Philippe Clicquot, the house's founder and the widow's father-in-law. I recommend this tour if you're interested in the history of Champagne, as well as World War I. Many of the caves in Reims were used as shelter during The Great War, including the ones you walk through at Veuve Clicquot. Chalk caves at Veuve Clicquot. I made the mistake of leaning on the walls! Crossing off a bucket list item with one of my best friends! The more famous Notre-Dame de Paris is cool and all but I'll let you in on something: the one in Reims is more impressive. History buffs and architecture nerds, get to this place ASAP. With its awe-inspiring stained glass windows, the Cathedral sits on the site where Clovis I, the first king of the Franks, was baptized in 496. After the original structure was destroyed in a fire in 1211, the current structure was built from 1211 to 1345. From 1027 to 1825, the site played host to the French monarchs' coronations. And I'm barely scratching the surface of its long history. While we were there, they had an in-depth and informative display documenting the Cathedral's history and ongoing restorations. One of the large Cathedral doors. On the right, a bit of the restoration scaffolding. I can see why the French kings trekked to Reims for their coronations. Before arriving in Reims, I didn't think there would be much to do besides visiting the Champagne houses. I was pleasantly surprised to find tons of sidewalk cafés to host one of our favorite activities: drinking outdoors. While I love the Parisian sidewalk café style for its coziness, these outdoor seating areas were much larger and reminded me of what we found in Germany a few years back. We enjoyed some good meals and many (many) bottles of bubbly outside, just people watching and relaxing. If you like to indulge and appreciate your surroundings, this is an activity for you. Biscuit rose de Reims (n.): A biscuit made pink by the addition of carmine. It is a regional specialty customarily dipped in Champagne. Dessert and Champagne outdoors. My tiramisu featured biscuit rose de Reims. Bistro lunch outdoors... and more Champagne! There's a multitude of fine Champagne houses in Reims and neighboring Épernay that open their doors to visitors. Champagne is expensive no matter where you are, but this experience was worth every penny. Tell me which wine destination I have to visit next!